Q. We have Extreme Blue Enhanced and three construction sites with Extreme Blue timeclocks. Can one person load data from all three into their smartphone before sending the data to the main office? A. Yes, you can collect from all 3 clocks with one smartphone before sending. If you use a USB drive to collect your data, you can also collect the data from all three clocks before returning to the main office and downloading it to the TimePilot software. Q. I have an employee who is a sub-contractor and is using TimePilot to submit his time. Our regular employees receive overtime pay, but the sub-contractor does not. How do I set this one particular employee up so he receives no overtime hours? A. The key phrase here is “Pay Type.” When you set up TimePilot, you created a Pay Type, which is a combination of your company’s policies (including overtime) and assigned it to each employee. Now you’ll apply the new Pay Type to the sub-contractor. Double-click the sub-contractor’s name in TimePilot Central to open their profile. In the “Pay Type” area, click the button to open the drop-down menu and choose the name of the new Pay Type you just created. Any overtime hours accumulated during the current pay period before making the change will be changed to regular hours and all hours will appear as regular house from this point on. Q. If I had more than one TimePilot timeclock, would I be able to tell which location my employees are clocking in at? We have 4 to 5 jobsites running at a time and I need to be able to tell who clocked in at which location. A. Yes. When you set up your clocks, you'll give each a name. If you give each clock the name of its location, each transaction in TimePilot Central will display the name of the clock where the transactions took place. Look for a column called "Clock Name." Don't see it? It's probably turned off. To learn how to turn it on, see the lead article in this newsletter issue from May 2015. Q. We are currently using 3 Extreme Blue clocks with the Enterprise software. We want to add 2 Vetro clocks for in-house use. Can I buy the "Additional TimePilot Vetro Clocks" and use them with our existing software? A. Yes you can. A hallmark of TimePilot Extreme Blue Enhanced, Tap+, Vetro and TimePilot PC is that all four products will work together. To get the new Vetros up and running on your system, start TimePilot Central, then open Clock Manager by clicking "Setup" > "Clock Manager." Once in Clock Manager, click its "Setup" menu and choose "New Clock Wizard." The wizard will step you through the setup process. TimePilot Q&A:Loading data into the TimePilot smartphone app from three sites; setting up subcontractors; associating a location with your clocks. TimePilot Lead Story: Connecting Vetro to your network. The Deal: 25% off iButtons. First, make sure the Vetro clock itself is ready to be connected to the network. Go to the clock and press 99 > OK > your 6-digit password > #5 Network. At this screen, make sure DHCP is "on." If DCHP is off, press #1 to turn it on. Now press the ESC key on the clock until you’re back to the clock face. 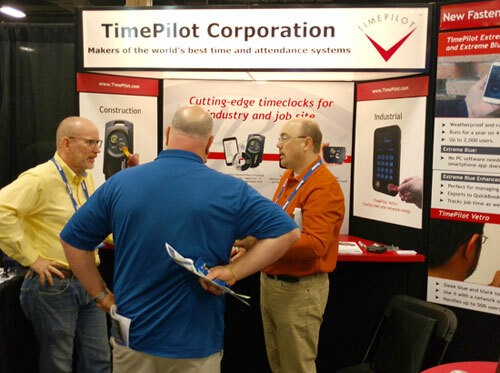 TimePilot makes a splash at the Fastenal show: CEO Doug Marsh (left) answers questions about TimePilot systems from attendees at the Fastenal Customer Industrial & Construction Expo last month in Nashville. Choose your color, choose your quantity!